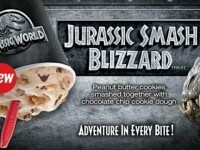 Dairy Queen announced their next “Blizzard Treat of the Month” and it is none other than….drum-roll…..Reese’s Peanut Butter Cups? 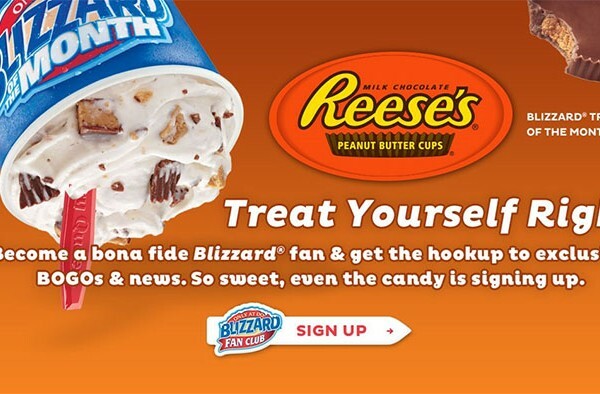 Yes, the tried and true Resses Peanut Butter Cup flavor…the flavor that is always on the menu…is somenow the special blizzard this month. What does that mean for you and me? It doesn’t really mean much since we could have ordered it during any month. It seems like the folks at Dairy Queen were “phoning it in” this month, but none the less, I will enjoy reviewing this, because I have had it many times, and it is delicious. 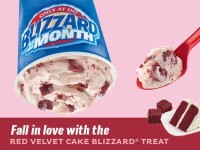 It is actually my favorite blizzard on the menu, and would have preferred it to my last blizzard experience. If you aren’t a fan of the Reeses Peanut Butter Cup Blizzard – first of all, you are crazy – but also you can still get the Apple Pie Blizzard (which is sort of meh) or the Pumpkin Pie Blizzard. One of the benefits though of this announcement is the Buy One Get One Free coupon that comes with it in an email for Blizzard fans. If you aren’t a part of the Blizzard fan club, I suggest you join. 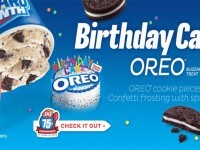 They give you several BOGO Blizzards throughout the year, as well as your birthday.